Oh yeah, need I write anything about this gorgeous Nordic god? Mind you I have never really liked blondes because to me a guy that is blonde tend to be what I deem "too pretty." However Alex, is hot and I mean HOT. 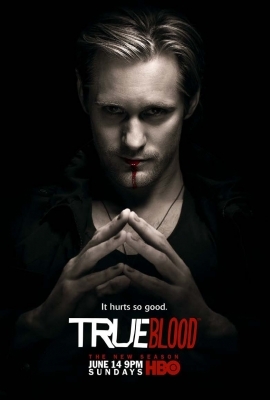 Every time I see him in True Blood playing Eric Northman I get heart palpations. The man just exudes masculinity--like the true stuff--all 6'4" of hunkiness! The Sookie-Eric-Bill love triangle keeps me on pins and needles--I kinda wish Sookie would give in once. I can't wait til the new show starts in June. But until then I am fighting the urge to fly to Sweden right now in search of a beautiful Swede. Alexander comes from an acting family, his father is actor Stellen Skarsgard and his brother is Swedish actor Gustaf Skarsgard (another super hottie), and he was born in Stockholm, Sweden. He got his first "American film" part in Ben Stiller's Zoolander in 2001 and earned most of his chops in his homeland before blowing up in America. It seems Mr. Skarsgard is here to stay and who are we to deny him that? In fact, we do not mind it all. 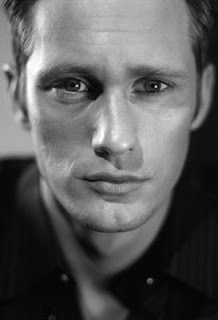 Stay Mr. Skarsgard.. Stay..
Stay tuned for more men's stuff in about an hour.. smooches! 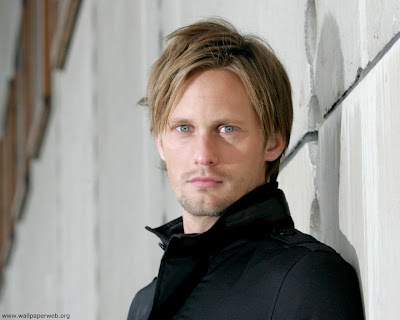 2 comments on "Hottie of the Week--Alexander Skarsgard"